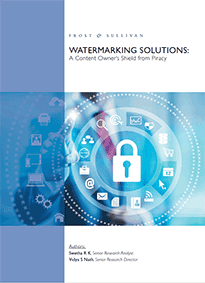 Analyst firm Frost & Sullivan explains how new content protection mechanisms can deter and detect TV content piracy, outlining alternative approaches to watermarking TV content distributed over the internet. distributor. If you answer “yes” to more than two of these, it is critical for you to consider a robust content protection solution such as watermarking. Do you produce high resolution content in HD, 4K/UHD, and HDR? Is your content distributed online? Do you usually find your content stolen post-decryption? Do you offer live streaming of sports or events? Do you offer TV Everywhere /OTT services as part of your portfolio? Do you offer content that has a huge demand among viewers?